We often wonder why Our Lady comes to us, miraculously and cries. When we began our trip to Sicily, we didn’t know about Our Lady Who Cried. We went to Siracusa because we heard of the great Greek and Roman amphitheaters. 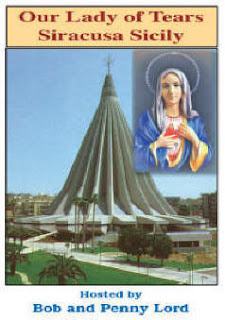 But you cannot visit Syracuse or Siracusa as it is known in Italy, without visiting the Shrine of Our Lady Who Cried. Quite honestly, we were more than a little skeptical, until we discovered all the invaluable, indisputable scientific evidence assuring us it was legitimate. Like Bishop Ettore Baranzini, we have always had reservation when it came to alleged apparitions and purported miracles. Only when Mother Church verifies do we write and make programs. Our story begins in Syracuse on the 29th of August, 1953, Five months before, Antonina and Angelo Jannuso were married. Because they were a struggling young couple, with Angelo a poor worker earning the barest minimum wages, they accepted his brother’s gracious invitation and moved into his small house on Via degli Orti di E. Giorgio. The day of their marriage, they received a plaster plaque of the Immaculate Heart of Mary, as a wedding present. Although they were what we would call, lukewarm Catholics, barely doing their Church duties by going to church on Sundays, they reverently placed the plaster plaque on the wall above their bed. Soon after they were married, they discovered they were to know the blessing of giving birth to a child. The couple was overjoyed, but typical of the hardworking poor class of Sicily, things were not going to be easy. They discovered Antonina had toxemia. This not only caused her to have excruciating convulsions, the convulsions, at times, resulted in her suffering bouts of blindness. On the day of the miracle, August 29th, Antonina was blinded, due to a seizure resulting from her convulsions. She was totally blind from three in the morning until eight thirty that evening, when her eyesight was totally restored. She later wrote that she turned to the image of the Immaculate Heart of Mary over her bed, to give thanksgiving to Our Lady for her returned eyesight, when to her utter astonishment what did she see, but the plaque of Our Lady was crying. She called out to her sister-in-law and aunt who, when she recounted what she had seen, thought she was delusional due to her illness. She said she then insisted they look closely at the image of Our Lady. They reluctantly did as she asked. When they moved closer to the image, they too saw the tears flowing from the eyes of Our Lady, and attested to the fact they, as well, saw some tears run down Her face unto the headboard of her bed. Needless to say, upon witnessing the image crying, they had mixed feelings – fright mixed with awe and wonderment. They immediately set out to advise the neighbors. They removed the plaque from the wall and carried it outside so the neighbors could see what they had seen. The neighbors could do nothing less than confirm that which they too had seen. The image of our Lady was shedding tears! As you can imagine, word soon got out. Visitors came from far and near to witness the miraculous phenomena for themselves. People are always looking for the supernatural! Not only the inquisitive came but a well-respected gentleman in the neighborhood, one Mario Messina came; and after he too noticed the tears spilling from the eyes of the image, he removed the plaque from the wall to see if possibly the tears were not coming through the plaster plaque from a hidden reservoir. Upon examining it, he could do nothing but affirm that he could see no evidence disputing the miraculous formation of tears on the plaque. They dried the plaque and tears quickly formed on the dry surface. As the crowds swelled, jamming themselves into the small house to see the image, the authorities, with the Jannusos’ permission, removed the plaque from the wall and hung it on the outer wall of the house to satisfy the curiosity of all those who had heard of the miraculous occurrence. Seeing the numbers increasing, rather than lessening, and finding it more and more difficult to maintain any semblance of order, the local carabiniere decided to bring the plaque to the local police station. The image continued to weep, even as it was being conveyed carefully to the local police station. But once inside the station, forty minutes had not passed when the image ceased weeping. Consequently, it was restored to its rightful home – the home where the Jannusos lived. Now, the people had not moved from outside the little house. So, at 2 a.m., on Sunday, August the 30th, the plaque, which had resumed crying, was placed on a pillow for all to see and venerate. Monday, the plaque was pinned to the wall. Whereupon, the people began collecting tears on handkerchiefs, pieces of cotton and all sorts of bits of cloth. Our Lady, kind and obliging Mother that She is, was able to assure Her children that in truth a miracle had come about – for them! As it was not securely attached to the wall, they decided to bring the plaque to the house across the road and have it placed on an Altar fashioned just for this purpose. The crowds continued to come. As they approached the image of Our Lady, they went down on their knees and began praying the Rosary. That done, the Rosary was finished; the plaque was gently carried back to the Jannuso home. You are currently browsing the archives for the Our Lady of Tears category.